Day 10. My walking has improved a lot, so much so, that I suggested to Nick that we try a few small tango walking steps. We stood facing each other with my crutches parked against the kitchen bench. We opened our arms to take the embrace. It felt odd and uncomfortable. I think I must have been standing stiffly, Nick’s posture felt nervous and the whole thing was awkward. Nick took a tentative few tiny steps, I tried to follow but my right leg and hip had very little strength. Walking backwards felt unsafe and definitely unpleasurable. OK. I wasn’t ready for that but decided to practise by myself. I could hold onto the kitchen bench and walk backwards at my own pace. That was better. I continued to walk to the music and when we tried again the next day the ‘experience’ did feel safer and marginally more fluent. About the next day, about day 12 by now, the muscles in my feet sort of released so that I could walk heel ,sole and toe- not just plonking down a flat foot. That made a big difference to the smoothness of my walking and the practice to the music became very enjoyable. I could do this with just one crutch now. Return to Tango After a Total Hip Replacement. Day 7. What a triumph of medical technology and surgical skill that has been. 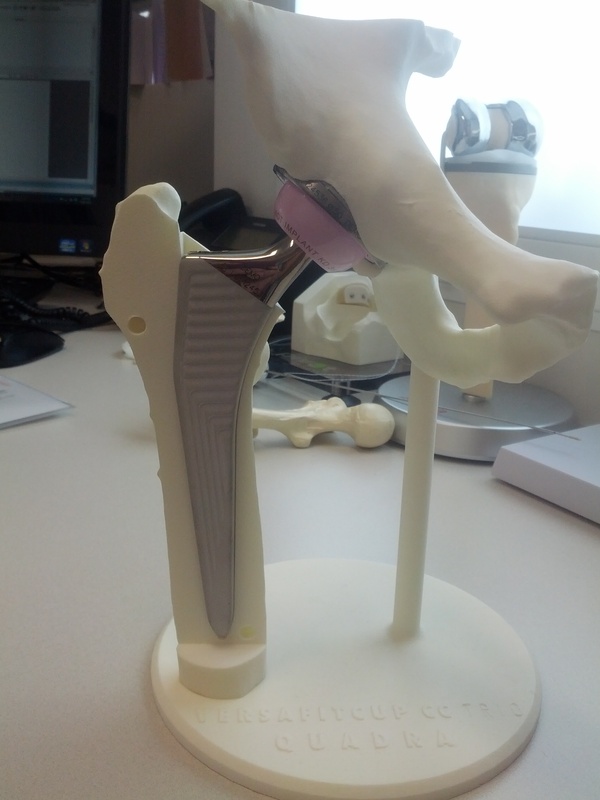 This is Mr Phong Tran’s demonstration ceramic and titanium hip joint – the stem and the socket. I like the grooves on the unpolished shaft (see the cutaway image) which encourage the new bone growth to attach to..
It’s a strange thought to think of that new inert shaft being inserted and cemented into my living femur. My femur is now truncated, neatly sawn off, and the slim, shiny titanium stem extends and holds the polished ceramic ball. I meant to ask if it really is pink. I try to imagine how my body’s muscles, blood vessels, tendons and nerves, adjust to the different proportions, edges and angles.They must have to fold in and around the new structure. I’d like to see a real colour 3D image of that. I can’t tell by feel. I don’t feel anything in my hip – it’s not numb- but there is no glute pain, no inner ache. Nothing. Is that what normal is like? I’ve forgotten. Of course, I don’t really know what I might be feeling in there because I’m on 12 hourly Targin tablets which I’m presuming are suppressing any pain. Do you have pain if you don’t feel it? This new hip is working very well. The Anterior approach, a 10 cm incision on the thigh, starting from the crease between the body and the thigh, has eliminated most of the restrictons which follow Lateral or Posterior approaches. The only real restriction is to not lunge or step back too strongly with the new hip. This puts pressure on the incision and the weakened, settling muscles. This move is actually alarmingly like the lady’s walking step backwards in tango. I’m going to have to be very careful with that for about 6 weeks. In fact, my new hip is thinking Tango! Today I put some tango music on while I was doing my exercises. I was practising walking tall and evenly with my crutches and found myself walking in tango rhythm. What a happy unanticipated moment it was to feel the spontaneous movement after all the post-op careful, controlled and on the edge of pain walking up. It’s been fourteen days since my right anterior total hip replacement operation on Tuesday January 13th, 2015. The operation, performed by Mr Phong Tran, went well. Both hips are level, and here at home I can now walk around without crutches. Now, the biggest improvement for me is that at night I am sleeping again. I had about nine months before the operation of tossing and turning and never being comfortable in bed. I would have to get up in the night and walk around, do my stretching exercises, refill the hot water bottle, have a cup of tea, anything to distract me from the nagging and niggling ache. I would lie on a tennis ball, judiciously placed under my hip’s right buttock to relieve the inner pain. The four nights in hospital weren’t good even though I had a spacious private room. A hospital is often noisy at night, and in this orthopaedic ward where there is a constant need for ice to relieve sore joints, the corridors sometimes rang with the sound of ice crushing. I was always waiting for the pain relief, sometimes up to three hours when the pain had reached the 8/10 mark. The hospital system understandably allows no flexibility in the prescribed timing or dosage of analgesic drugs. The 24 hour time lag in adjustments was difficult. However, the visiting peri-operative physician improved the pain relief regime each day until it was nearly right by the time I got home. I went straight home from the hospital, and as soon as I was at home I sat down and looked at what drugs I was able to take and adjusted the timing so that there were no distinct peaks and troughs in pain relief delivery. Being at home meant that I had discretion of up to two hours with the panadeine I took, and that made a big difference. My first night at home was magnificent. I slept. I did have to get up with a rather restless bladder (I’m drinking a lot of water) but went to sleep again immediately. I’m surprised I’m not bothered by having to sleep on my back. I have now had seven nights of sleep and feel there is quite a bit of pleasant catching up to do. The pain issue has been interesting and quite difficult for me to work out. During the operation, a tube was inserted into the joint for 48 hours of constant delivery of local anaesthetic from a little pouch which lay next to my thigh. I felt no pain at all from the joint. But there was a lot of generalised pain around my back, abdomen and thigh muscles. I hadn’t expected this and it was quite difficult to manage. I’ve learned that the back pain is related to the rather vigorous manipulation during the operation in which the hip had to be dislocated, and also to imbalance from the preceding months of limping. My thigh muscles are sometimes excruciatingly painful – not surprising considering that , although they weren’t cut during the operation, they were pulled aside and held there while work on the bone and prosthesis took place. The poor things are still grumbling, as are the tendons, one of which had to be cut and repaired. They like ice packs. My back likes a hot water bottle. One of the things I was hoping to be an outcome of the surgery was not having to take pills any more. Usually I take nothing, touch wood, and I was fed up with having to rely on pills and vigilant timing to be able to function at all. Strangely enough, now I am taking many more but I’m not bothered. I think it’s because I know that the prime cause of the pain has been removed and that the need for pills will diminish as I become stronger and my body heals. I’m a bit fuzzy in the head at times but don’t mind. I just have a rest and feel relieved that it’s all over. I am astonished at how well I’m getting about. As I said, I can walk around home from about 12 days after the operation without crutches, if I’m not tired. It was bliss the morning after the operation when the physio helped me move my leg and lightly bend the right knee which with my leg had been safely immobilised overnight. The leg was really aching by that time. It hurt to move but the movement was better than the ache. I swung around to sit on the side of the bed and lowered it to the floor. It was painful but OK. Then he helped me up into a standing walking frame and there I was, standing on two legs 16 hours after the operation. I walked a bit around the room and from then on walked everywhere. That afternoon he brought my crutches and I walked out to the corridor to do my first set of standing exercises. I’d been doing the bed ones since regaining feeling in my legs and feet. From then it became easier. Exercises 3 times a day, walks in the coirridor, learning how to go up and down steps. I concentrated on walking tall and as evenly as I could without limping or swaying from side to side. By now I was very appreciative of the pilates and physiotherapy I had been doing in preparation for the surgery. I managed getting into and out of the car perfectly well, and it wasn’t much different from my efforts before the operation. Home was comfortable and manageable. I had hired a shower seat which feels safe and luxurious. I’m increasing my walks outside on the one crutch now and feel well on the way! This afternoon I’m celebrating a recovery goal. Nick and I are going to Sidewalk Tango’s Australia Day barbecue and milonga. I will climb the concrete stairs to my tango world. I will see my tango friends again, hear the tango music, enjoy the familiar Tiki Bar, and I will definitely at least stand on the dance floor in the tango embrace of dear Nick who has been looking after me so well. I’ve been watching this spontaneous effort for a few years. This young palm would have to have germinated originally from bird poo dropped from a perch on the tree above. It has just quietly grown into its shared space. What I like is that the Port Phillip Council tree maintenance workers are now treating it like the formally planted row of palms along Beach Street and Beaconsfield Parade. They give it an annual trim of its lower fronds. If you’re lucky enough to have a whole nature strip in front of your house, why would you let all that un-concreted, un-asphalted soil just lie there under grass? If you have a Council planted tree on your nature strip, why not put the soil around it to use? This unofficial commandeering of public space by residents is officially called ‘personalization of space and environment’. Port Melbourne and surrounds have some enjoyable examples. 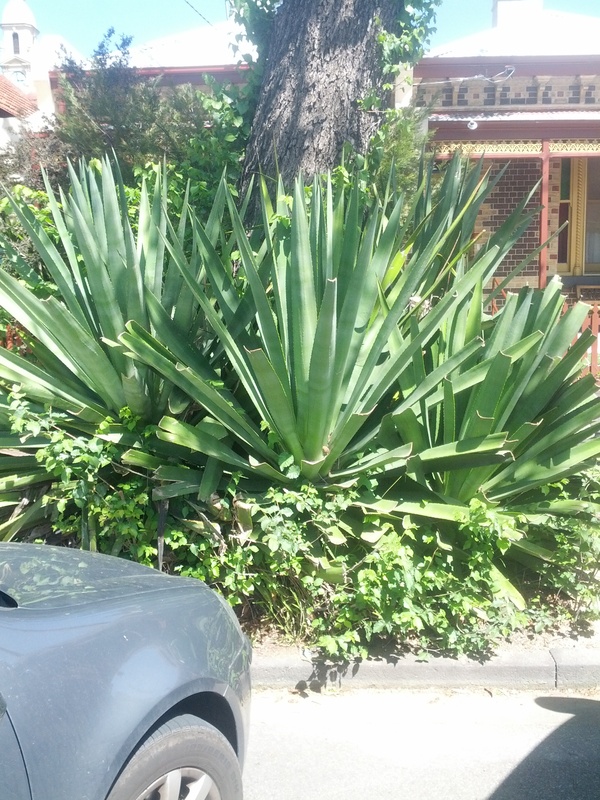 There is a magnificent aloe in South Melbourne, which feels a bit of an adventure to park in front of. 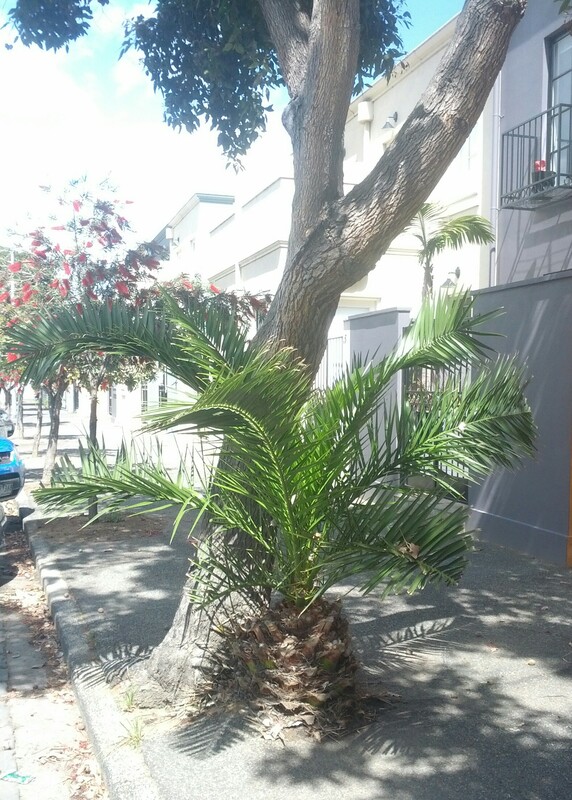 There are two trees planted up like this and I like the bizarreness of their spreading size in the street scape. I speculate as to how old they are and am glad that Port Phillip Council has left them alone to grow so absurdly. Tomorrow my right hip will be excised, pruned, dismantled, de-commissioned, removed, taken away, discarded, supplanted, to be replaced, implanted. Something made of living bone which has been with me for all of my life will be replaced with an inert substitute. I know that the hip joint I have now, at 69, is not composed of the same bone cells as the one I had when I was born but it is the same structure being replaced constantly with new cells all my life. It has known what shape it was meant to be and the cells just got on with it. I’ve never seen it. Like so much of my body it is buried deep, protected and wrapped by muscles and tendons. My mother tells me that one of my knees had to be dislocated to let me be born. But that knee has always felt fine. Tomorrow my right hip will have to be dislocated after the muscles have been laid bare and drawn aside to allow access to the joint: the anterior approach. The ball at the end of the femur, now arthritic and covered in cysts, will be dislodged from its socket now lacking intact cartilage, and both surfaces exposed to the air and the lights. I feel tender towards these poor worn out parts of my skeleton. At least the socket will still be in situ after being scraped out and resurfaced. But the femoral head will go. No saving it. Thank you hip! You served to crawl, walk, run, ride a tricycle and a bike, and drive a car. You played hopscotch, marbles, dodgie, rounders, softball, tennis, netball. You loved being in water, and swam and kicked up and down the Bendigo pool for miles and miles and miles; although you didn’t really like kicking that much. It was the shoulders living above you that pulled you through the water. You were made to ski, reluctantly. You enjoyed dancing at parties and later you went to work at jazz ballet. You never much liked walking and the feet below you hurt until they were equipped with orthotics. Just walking was boring, and you got sore and creaky – until you discovered that you loved walking up mountains on little uneven paths. Somehow this sort of walking suited you. It stopped you being bored and doing the same old steps all the time. Going down was fine, except that the knees had a grumble about that. When you were fifty you started working a potter’s wheel, which meant sitting with knees either side of a sort of drum enclosing the electric motor that turned the wheel. You had to make the right foot push down to work the power pedal near the floor. After about 14 years of this the muscles supporting you got very tight and made it hard for you to move easily. By the time you were sixty six you had given up the wheel, but then you climbed up some concrete stairs and started learning tango. This was hard for you. You had to carry a whole body’s weight on your own – hold, balance and swivel around on one foot. The muscles you needed weren’t strong enough to protect your cartilage. Soon you were scraping femoral head against boney socket and irritating muscles and tissues around you. You found it harder and harder to slide smoothly in the socket. You developed cysts. It was no good. X rays showed you had lost all your protection and lubrication. You were scraping bone on bone. You hurt! 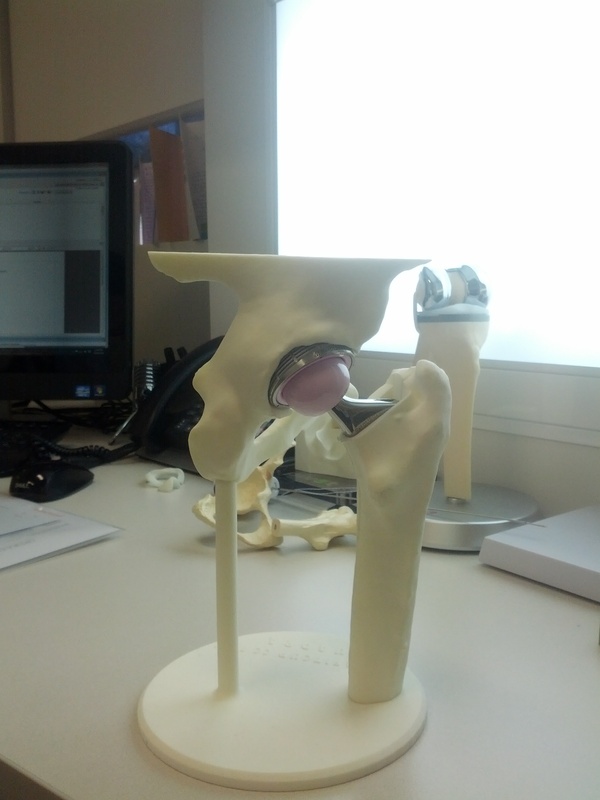 It is time to say ‘thank you’ for all the happiness and experiences you have given me, my dear hip joint. I’m sorry you have broken down. I’m glad I live in a time when I can be anaesthetized, my body cut open, have old damaged parts removed and new parts inserted, sewn up, woken up, pain controlled, infection minimized, and then helped to recover by people whose work it is to do so. Who would have thought that just walking backwards around a dance floor would be so fraught with complexity! The first two years of learning tango had been so full of new ideas, names, people, music and movements such as ochos, the Lady’s Basic and walking, that it was often difficult to recognise that my brain and the body actually had a connection with each other. By the third year, 2014, I decided to consciously turn my brain off and let my body do what it had been practising and repeating. It seemed to work. I stopped leading, though in class it had felt like ‘anticipating’, and enjoyed just waiting to see what happened. I felt that I was starting to get the feel of the dance and was enjoying the never-ending refinement of the most simple elements-such as the walk! The lady spends a lot of time balancing and turning on the one leg, and I became aware that my legs and hips were not as strong as they might have been. My right hip was getting sorer and sorer, feeling weak and it was painful to step that leg across my body. I stopped doing the classes, hoping rest would help. I sit in one of the big armchairs in the darker bar section of Sidewalk Tango watching the brightly lit Intermediate class, with my husband in it, work on the figure for the night. David calls, ‘Change partners,’ and the women move to the next man in the line of dance. My friends are practising their ochos and adornments while I sit and tell myself that it’s quite good to learn by watching. Hah! Who am I kidding? I long to be out there with them. Rest, Pilates and the Physio seemed to be getting me nowhere so towards the end of October, I took myself off to the GP. My hip movement was restricted enough for her to write two referrals, one for an Xray and the other for an orthopaedic surgeon. She was certain that I had osteo-arthritis and would probably need a hip replacement. I was shocked but she was absolutely right. By November, I’m sitting in the rooms of the surgeon and holding a surprisingly heavy ceramic and titanium replacement hip joint as he explains how it works. Up on the screen, my right hip joint showed as an amorphous, grey shadowy mass. I had been surprised too. Up to that point I had had no direct pain in the hip but a lot of what I now realize was referred pain in my hip flexor and glutes. I was almost too afraid to ask if I’d be able to return to the balancing, turning and twisting of tango, but did. Yes, I will. The physiotherapy will get me there. I can’t wait! The surgeon has a really good website,which has an animation of the Anterior Total Hip Replacement operation. After the incision in the front of the hip, the muscles are drawn aside in turn, getting ever deeper and deeper to reveal at last, the star of the show, the arthritic hip joint, whitely gleaming. I’m reminded of the series of curtains being drawn at the cinema before the screen appears with the promise of real action. Here, the action continues with the hip being dislocated, the top of the femur sawn off and the replacement inserted into a hole drilled into the femur. A new socket is cemented into the old one, and the replacement ball placed into it. The muscles are released to return to their tight overlapping pattern, enfolding and protecting my new hip. All this looks deceptively simple on the computer screen, with no blood or real body parts. This is where the huge, exciting leap happens as the surgeon’s skill, experience and expertise translate this cool, schematic plan into reality in the flesh and blood of my body. On my part, this is where real trust is needed. By the end of November, I had a date for my surgery – January 13, 2015. There’s now the prospect of returning to normal life. I’ve been living in limbo for months. I can’t tango. I can’t walk. I can’t sleep. I can’t think clearly. I’ve been holding pain at bay with pain killers and anti-inflammatories. My strength and agility have gone. I feel off-colour a lot of the time. I’m increasingly irritable and hard to live with. But now I wait. By January I was in real pain within the hip and finding walking any distance at all extremely painful. There are two days to go. Tango, Arthritis, A Hip Replacement and a Return to Tango .